I found myself to be quite satisfied by playing this level. Although the design, details and shadows are average quality the gameplay is quite strong with over two hundred enemies. There are some pretty good shadows around the level - mostly seen in outdoor locations. 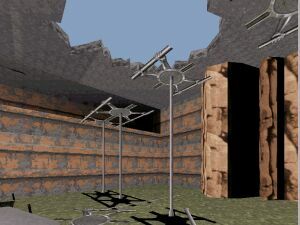 Some areas lack shadows and light sources. Design is a bit empty although it's not as bothering as it's in some levels. Nature is well mixed with industrial buildings. You won't spot many different textures - Desert and that lightbrown concrete textures are maybe a bit overused. I liked the puzzles although they were quite simple. There was this one pretty annoying location where you had to kept jumping over an electrized floor to avoid energy loss. Doesn't offer anything new to experienced players except a bit over ten minutes of simple fun.